Michael Capozzoli, "Cappi" is walking 3000 miles from Dana Point, CA to Boston, MA raising money to build Pet Friendly Housing for Victims of Domestic Violence. Sedona, AZ, February 09, 2018 --(PR.com)-- 66 year-old, Michael Capozzoli, is walking 3000 miles across America raising money and awareness for domestic violence shelters. 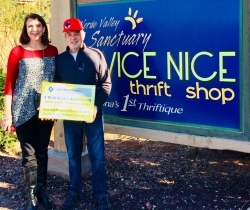 Specifically, he is helping to raise the $250,000 necessary to build a pet friendly shelter for the Verde Valley Sanctuary, a domestic violence shelter in his home town of Sedona, AZ. He is walking from Dana Point, California to Boston, Massachusetts with stops in 14 major cities along the way. As of 2/07/2018 he has raised $22,460. Cappi will began his journey on February 1st in Dana Point, California and is walking approximately 20 miles per day and plans to arrive in Boston on his birthday, September 25th. Major stops include: Palm Springs, Blythe, Phoenix, Albuquerque, Amarillo, Oklahoma City, Tulsa, Branson, St. Louis, Indianapolis, Cleveland, Buffalo, Albany and Boston. Cappi is determined to make a difference in the lives of those who are or have been victims of abuse. On average 20 people per minute are victims of physical violence by an intimate partner in the United States. Many victims will not seek safe shelter because they do not have a place for their beloved pet. The Verde Valley Sanctuary is aiming to end that obstacle at their shelter outside of Sedona Arizona by building a pet friendly option for victims. Cappi aims to support other worthy organizations and shelters across the country on his journey.